I was recently invited to select an item to review from the product line of personalizedcart.com. I looked over their often unique selection and chose the Custom Yeti Rambler . . . and am happy to say an additional one is available for me to give away (USA only). 30 oz size - holds a lot! 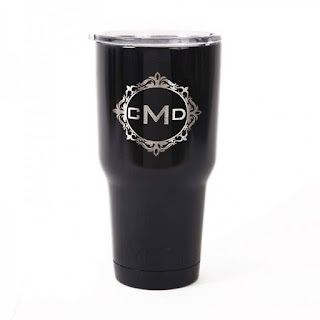 Insulated stainless steel - beverages stay cold - or hot for hours! personalizedcart.com says; "The Rambler® 30 oz. 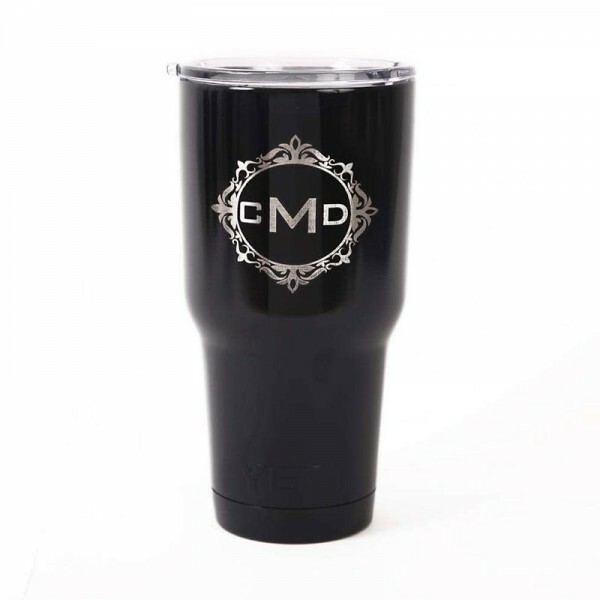 is the tumbler that gets you through the day. Your morning brew stays hot, and your iced coffee will stay cold - so take your time. Kitchen-grade stainless steel with double-wall vacuum insulation will protect your drink at all costs. Available in stainless and DuraCoat™ colors that won't peel, fade, or crack." Yeti says their Custom Yeti Rambler, "keeps your drink as COLD as science allows" and I have to say it looks like they do! My tea stayed cold all day (they say they keep cold drinks cold at least 24 hours and warm drinks warm at least 12 hours.) I do not tend to drink enough each day, but by putting my blueberry, blackberry, raspberry green tea in this Custom Yeti Rambler, I am drinking what I should. I also have to say I found personalizedcart.com to be easy to work with - they had me approve the design and made the change I asked and then sent the cup right away - I was surprised - pleasantly so - with how quickly it arrived. Their selection of product is unique and I see a number of items I could order for family members and be able to give them wonderful gifts. I would definitely order from them in the future. I am happy to say, not only did personalizedcart.com send me one Custom Yeti Rambler for review, but they are making another available for me to give away (USA only). If you are over the age of 18, would like to be in this drawing on August 15, 2018, please comment below to share what color and how you would personalize your Custom Yeti Rambler if you win - I went with purple and had them put "Grandmas with Heart" on it. In addition, if you have followed on Google Friend Connect, followed by liking on facebook with the tab in the "Find us on Facebook" box ON THE BLOG, or at this link (not just liking the post) and/or have followed grandma's cookie jar by email, you will receive one entry for each of these which you have done (as long as you let me know which of these you have done by commenting below.) Plus, if you "share" this post, you will receive one additional entry the first time you share in any of these places (please let me know when and where you share). This will help me draw names from among people who would like to win one Custom Yeti Rambler and it gives you several ways to enter the giveaway! Thank you for reading grandma's cookie jar and for sharing it with the people you know! I would choose Blue and have ZT on it. I would choose the pink and get one of those cute sugar skulls on it! I follow you on Facebook, Google+, Pinterest, and Twitter. I shared this post on Facebook, Twitter, Pinterest, and Google+! I would choose black and have my initials on it! I would choose the pink with no engraving.